Next to the name of Nakamura Utaemon III are the characters 一世一代 or issei ichidai. This translates loosely as "performance of a career" or "once-in-a-lifetime performance". This is an expression used when an aging actor appears in his final role. "Both issei and ichidai are ways of saying 'a human life,' and their use together gives greater weight than would either word used alone. It demonstrates traditionally given in Japan to the lifework of a serious artist." Quoted from: The New Kabuki Encyclopedia by Samuel L. Leiter, p. 226. Keisei hangankō was a play created by Chikamatsu Monzaemon. The Japan Arts Council gives a summary of part of it. The painter, Ukiyo Matahe, who has a speech impediment, comes with his wife Otoku to visit the house of his teacher Shogen to get permission to use the professional name "Tosa." But Shogen refuses and says the surname cannot be granted to Matahe unless he has done a meritorious deed as a painter. Matahe, driven to despair, decides to kill himself. He paints a farewell self-portrait on a chozubachi (washbasin made of stone), and a miracle occurs - his self-portrait is so powerful that it penetrates the stone and is visible on the back side of the chozubachi. Happily, Matahe is granted the right to use the professional name Tosa Mitsuoki, as a fully-licensed high-status artist of the Tosa school. The main characters are Matahe, who thinks intensely, and Otoku who helps him. 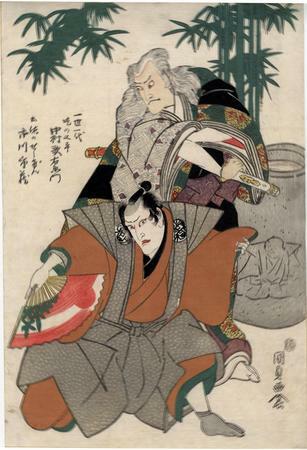 This scene is imbued with their love of being thoughtful each other.The climax of the play is the moment when they realize that the self-portrait Matahe has painted on the chozubachi has penetrated to the back of the stone basin. Another highlight is Matahe's 'Daigashira no mai' dance to the accompaniment of the tsuzumi (hand drum) played by Otoku, after he has received permission to use the school name. Notice the chōzubachi (手水鉢) near the two men with the figure of a supplicant man kneeling on the front of it. This print commemorates a performance of this play on the 15th day of the 7th month of 1816. At one point, we thought the intense black lines on the design of the mon on the kneeling figure was added after the fact. Now we are not so sure, because the example of this print in the Hankyu Cultural Foundation has the same exact feature.